To suit all Skid Steers such as Bobcat, ASV, Caterpillar, Kubota, Terex, Takeuchi, Case, Mustang and Deere. Australian manufactured. Free floating pallet forks to suit Skid Steers. A floating tyne design offers unparalleled safety for skid steer loaders. Unlike forklifts, skid steers are able to crowd their pickup past horizontal allowing the machine to be placed in an unsafe position which could cause it to tip over. Furthermore, putting the machine’s weight on the tynes may cause them to weaken or break. 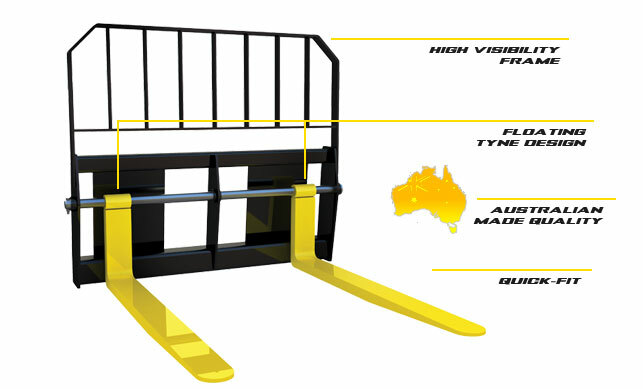 If you care about safety then a floating tyne design is the only safe choice for skid steer loaders. Pallet fork frame & set of tynes. Let us know your skid steer at time of order and frame will be supplied to suit.